Crude is trending lower this morning, though the near-term fundamental news of the week has been relatively supportive. Despite oil inventories continuing their trend lower, crude prices fell slightly yesterday, giving up 12 cents. 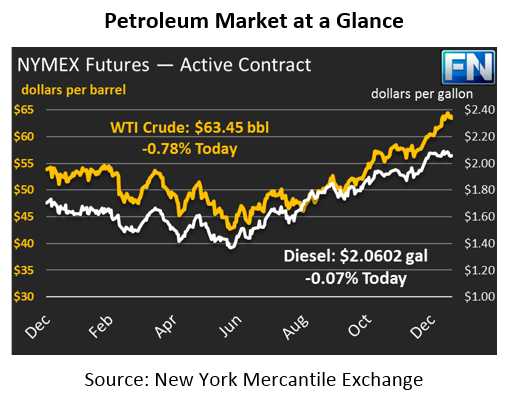 Today, prices are a good deal lower, with crude prices currently at $63.45, a loss of 50 cents (-0.8%). Refined products are also in the red. Diesel fuel, which fell by over a cent yesterday, is currently down a lite 0.2 cents, trading at $2.0602. Gasoline, which has had a strong week and gained about 1.2 cents yesterday, is farther in the red today. Gasoline prices are trading 1.4 cents (-0.8%) lower, at $1.8691. The EIA released their inventory report yesterday, and the headlines were firmly bullish. Crude inventories are continuing their declines, countering the seasonal trend of rising crude stocks. The crude withdrawal nearly doubled market expectations. Gasoline draws were in line with the market’s view, but diesel inventories showed a large surprise draw. Looking beyond near-term fundamentals, the IEA and OPEC both released reports this week that have cooled the market’s bullishness, at least for now. 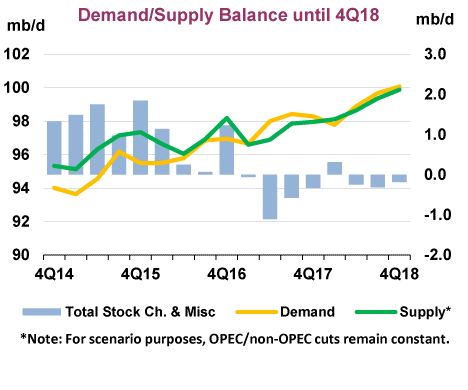 Headlines have focused on notable upward revisions to U.S. and other non-OPEC production, with demand forecasts unchanged or just slightly higher. Interestingly, the IEA shows a very small net shortage of fuel in 2018, though the data assumes OPEC’s cuts remain through the end of 2018.